Custom leather gun holster for a S&W Bodyguard 380 Pistol. Also fits KAHR P380 and Ruger LCP. NEW DESIGN! My new design is adjustable to face the gun either direction or use as a light weight sleeve holster in a case or purse by itself without the back. Change the direction of the holster easily by removing the two silver colored decorative Chicago screws. Take the screws out, reverse the holster, and replace the screws with a screwdriver or even a dime will work. The holster is made of quality veg tan leather, dyed brown with antiqued edges with an oiled finish and a water resistant sealer. 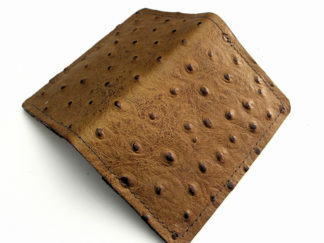 The edges are dyed, burnished and sealed. The back is rough out for a reason and that is to stay in your pocket should you need to draw the gun out. The rough out is sealed so you don't get leather particles on your clothes or in the gun. 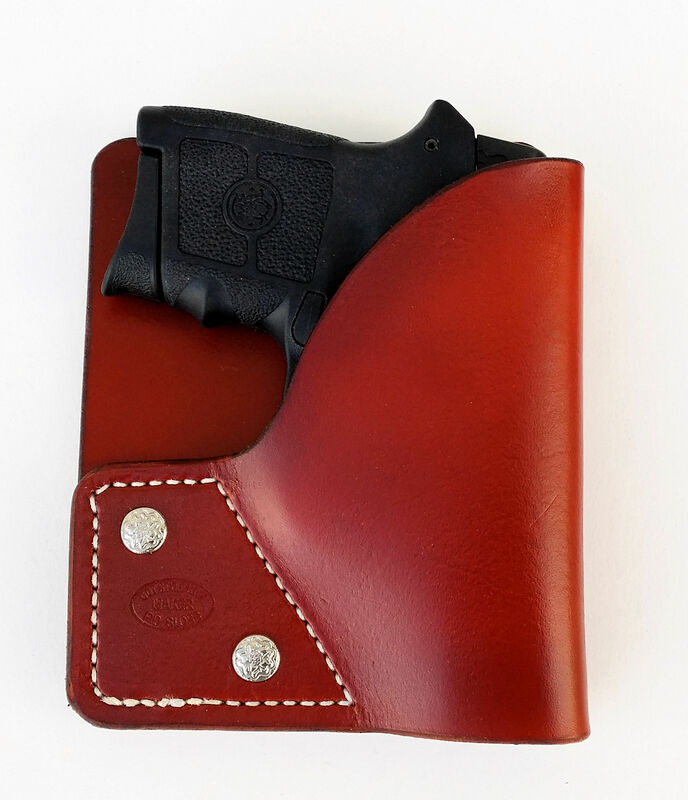 This holster is meant for concealed carry in your pocket. Please make sure you have a permit to carry or the correct state laws. Handcrafted 100% leather custom gun holster for a S&W Bodyguard 380 Pistol. Also fits KAHR P380 and Ruger LCP. NEW DESIGN! My new design is adjustable to face the gun either direction or use as a light weight sleeve holster in a case by itself without the back. Change the direction of the holster easily by removing the two silver colored decorative Chicago screws. Take the screws out, reverse the holster, and replace the screws with a screwdriver or even a dime will work. The holster is made of quality veg tan leather, dyed brown with antiqued edges with an oiled finish and a water resistant sealer. The edges are dyed, burnished and sealed. The back is rough out for a reason and that is to stay in your pocket should you need to draw the gun out. The rough out is sealed so you don’t get leather particles on your clothes or in the gun. 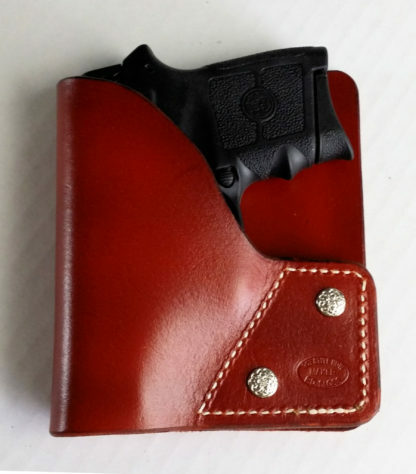 This holster is meant for concealed carry in your pocket. Please make sure you have a permit to carry or the correct state laws. 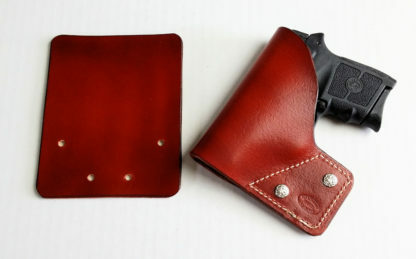 This holster is finished and ready to ship. This holster is made for a 380 without Crimson Trace. It is complete and ready to ship. I have NOT molded the holster to the gun for a reason. If you need to draw the gun, a molded holster needs something to attach to since it holds the gun tightly with the molding. This is great if you have one fastened securely on your belt but not good at all in a pocket. When you draw the gun, you don’t want the holster to come out with the gun and maybe only come part way off making you take the time to use two hands to get it off your gun. 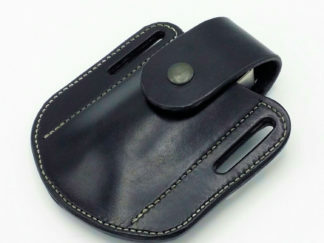 Your holster should be snug when you receive it but loosen up in a short time. 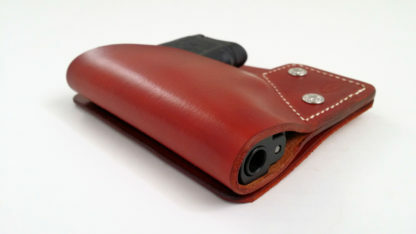 If you have a different gun, I can custom make a holster for you to fit any model of gun. I have blue guns (plastic models) of many models of guns and for the ones I do not have, I sometimes make a wood model of your gun to insure a perfect fit. I use the same process of making a wood model when I make vacuum formed phone cases. Of course this style would need to stay for a small gun or it could not be a pocket holster. Please see the measurements to make sure it will fit in your planned pocket before ordering.